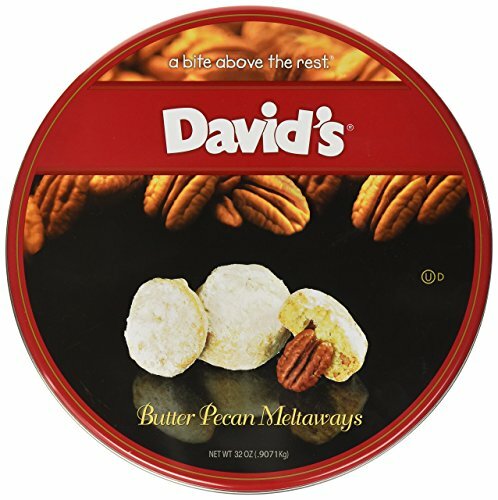 Upgrade your morning snack and afternoon treat with the oh-so-satisfying Butter Pecan Meltaways by Davids Cookies. This delectable snack is made with the finest ingredients of pure creamy butter and large pecan chunks that will certainly satisfy your craving. Enjoy it with your morning coffee or tea or serve it to your friends when they come over for afternoon visits. Giving this box of cookies is a thoughtful idea that is perfect for family, friends, coworkers, or anyone else you care about in your life, especially during the holiday season when everyone is jolly. Let your loved ones taste the scrumptious and sweet goodness of Davids Cookies Butter Pecan Meltaways by sending them right to their doorsteps. With the Butter Pecan Meltaways, you can enjoy a natural, guilt-free dessert that has no preservatives added and tastes just like you baked it at home. Since this box of sweet delight comes with 64 cookies, it is perfect to share with everyone. If you have any questions about this product by David's Cookies, contact us by completing and submitting the form below. If you are looking for a specif part number, please include it with your message. Dulcet Deluxe Gourmet Food Gift Basket: Prime Delivery:Graduation & Father day for Dad Grandfather Men him: Includes Assorted Brownies, Crumb Cakes Rugelach, and Muffins. Great gift idea! Low Carb Rum Balls - 12 Pack - Only 1 Net Carb Per Ball - Best Tasting Diet Product Ever!